The Fiesta (party/ celebration) is a big part of Mexican culture, often accompanied with loud music from impressive loud speakers until the early hours of the morning (as we've often found out). 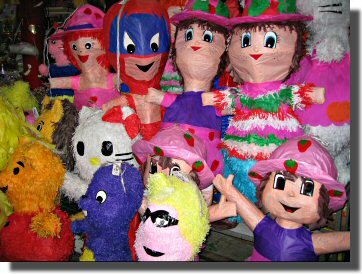 The pinata is a fun part of fiestas, used for hundreds of years to celebrate special occasions such as Christmas and birthdays. They were originally made of clay, filled with fruits and small vegetables. Today, they are colorful papier mâché characters filled with candy and toys. Traditionally, the pinata is suspended from a ceiling or tree branch. Blindfolded children break it open with sticks in order to collect the goodies inside. 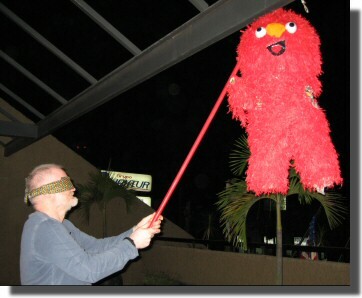 For Stephen's birthday, we had some energetic fun bashing an Elmo pinata to bits, proving that the tradition is not just for children. 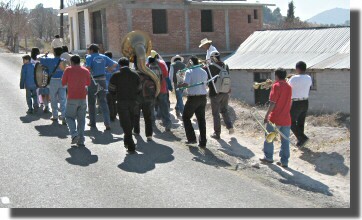 While driving through a small rural town, we drove past a young birthday girl proudly walking down the street with her own marching band! Mexicans sure know how to fiesta. No doubt the day ended with a pinata and her stick-wielding friends. Home - This page last changed on 2006-02-28.